By 1910, the cricket ground and a pavilion were laid out to the north of Gibbs Lane. The clubhouse was built in 1922, and paid for by the then serving officers of the Garrison. It consisted of a smoking and dining room, a gentlemen's cloakroom, a ladies' room and ladies cloakroom and a steward's quarter. The cricket pavilion became the groundsman's store. The occupancy was regularised in 1928 when a 21 year lease was drawn up. In the mid 1930s two squash courts, a badminton court, card room and kitchen were added to the clubhouse, and eight grass and two hard tennis courts and polo, hockey and rugby grounds were also added. As a result of this a new lease was assigned to OC Troops, Bordon in 1936, and a year later was transferred to the United Services Trustees. Between the wars the Club was a hive of activity. Two silver cups for polo (the Daly Cup and the Polo Cup) was battled for every fortnight; the ladies came down most afternoons in the summer to play tennis and frequent tennis and badminton tournaments were held; there was a flourishing bridge club, and innumerable dances. A new lease was granted in 1949 for a further period of 21 years, but this was superseded 12 years later in 1961 by another 21 year lease. The reason for this early renewal was that in 1959, because of financial problems and the difficulty of obtaining the services of a groundsman, the Club persuaded the War Department to take over the eight tennis courts and the cricket and hockey grounds, and so bring the number of Garrison grounds up to scale. In February 1961 these, together with the groundsman's store, were handed over to be maintained by the Works Organisation (later PSA) and a new 21 year lease was drawn up. The children's playground at the end of the tennis court area remained the property of the Club. In 1977, when the Army School of Transport left the Garrison, the number of serving officers making use of the Club dwindled rapidly, which, combined with impending construction of new squash courts in Havannah Barracks and a new officers' mess, made it clear that there was little justification for retaining a Club as a place of recreation for serving officers; and by 1980 the executive management of the Club had been put into the hands of a civilian committee. 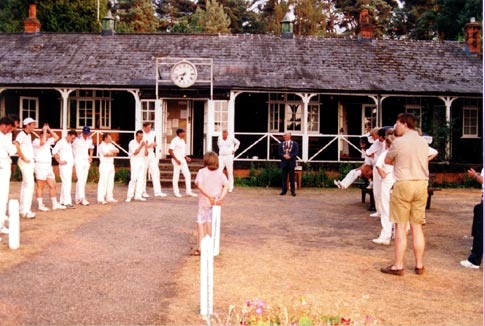 In 1995, as part of the VJ Day 50 th Anniversary celebrations, BOSC was used for a cricket match between the Army and the Town. The Mayor, Councillor Don Mayes sponsored a shield and replicas for the winning services team, and mementos for the Town team.